Understanding the behavior of proteins in living cells will shed light on mechanisms of cellular function, giving rise to the development of new medicines and other biological applications. Tracing the path of these proteins is a critical step in understanding the ways in which they function in the system. Thus, techniques such as protein labeling are surging. In 2015, the global protein-labeling market was estimated to be worth $1.9 billion. Growth is being driven by the intensification of drug R&D, the availability of new tests that are both effective and more convenient, and wider use in emerging economies. Growing at a five-year compound annual growth rate (CAGR) of 14.1%, BCC Research predicts that this market will reach $4.2 billion by the end of 2021. Research efforts in the areas of biotechnology, biochemistry, and analytical chemistry often require the use of molecular labels. These labels are covalently attached to proteins of interest to facilitate detection or purification of the labeled protein and/or its binding partners. Labeling strategies result in the covalent attachment of different molecules (e.g., reporter enzymes, biotin, radioactive isotopes, and fluorophores) to the target protein sequence. Many types of labels are available, but their varied uses are preferable for specific applications. Therefore, the type of label and labeling strategy used must be carefully considered for each application, depending on the objective. Biochemistry and medicine have benefited tremendously from the application of nanoparticles. They are useful in creating fluorescent biological labels for proteins, which can be used in drug research and diagnostics, as well as in the study of disease biology. In addition, nanoparticles can serve as efficient drug delivery systems. Purification and isolation of various biological molecules is possible with the aid of nanoparticles. Importantly, the detection of proteins becomes exceptionally easy with the help of nanoparticles. Scientists at Duke University have developed a way to concentrate nanoparticles inside a small device using only sound waves. This may help introduce portable diagnostics that rely on attaching nanoparticles to biomarkers such as proteins and measuring how many find their targets. The nanoparticles are tagged with fluorescent markers to make them easier to see. Then they are concentrated in a column by an acoustic whirlpool device. The acoustofluidic chip is small enough to be integrated into hand-held devices. The study was published in ACS Nano. With its advantages in simplicity, functionality, and power consumption, the chip is promising for many point-of-care applications. Yale University researchers sought to target and prevent micrometastasis, which is one of the leading causes of ovarian cancer recurrence. In a study published in Scientific Reports, a team of researchers fluorescently labeled micrometastases, which are groups of cancer cells (too small to be seen by the naked eye) that migrate from the original tumor site. The researchers were able to visualize micrometastases as small as 100 µm in mice. “Ovarian cancer is characterized by early intraperitoneal micrometastasis,” first author Ayesha Alvero said. “These are obviously not taken out during surgery [because] the surgeons cannot see them. As such, they become the source of recurrence.” In order to visualize the micrometastases with fluorescence, the team developed nanoparticles that bound to a peptide sequence found exclusively within blood vessels in the tumors. This meant that the researchers could stain large tumors and even micrometastases dark blue, without staining noncancerous tissue. According to Alvero, nanoparticles were used so that the dye would not be cleared in circulation, as naturally occurs. Additionally, the nanoparticles served as a kind of “scaffold for targeting,” she said. “The RGD-coating [the special protein sequence only found in tumor cells] serves as magnets that find and bind tumor-associated vessels, allowing the concentration in the tumor microenvironment,” Alvero said. The study has implications for both research and clinical practice. From a research perspective, the study is significant because it provides a potential platform for drug delivery, i.e., if the dye attached to the nanoparticles is replaced with a cancer-killing drug. The study is also capable of improving the rate of survival for patients with cancer, Alvero said. In addition to pinpointing where micrometastasis has occurred, the technology may help surgeons to spare healthy tissue. The team is in talks with companies to secure funding for a clinical trial. Innovation is critical to growth of the protein-labeling sector. Kit-based protein labeling is slowly being replaced by chemically synthesized tags through click chemistry and other newer and improved technologies. Synergistic advances in optical physics, probe design, molecular biology, and computational analysis have resulted in the design and development of new protein-labeling technologies that have the potential to propel the future market. “The ability of scientists to identify, label, and track proteins and protein mutations is critical to the diagnosis and deep understanding of disease. Its impact for the patient and for the development of targeted medicines is critical,” commented BCC Research Editorial Director Kevin Fitzgerald. 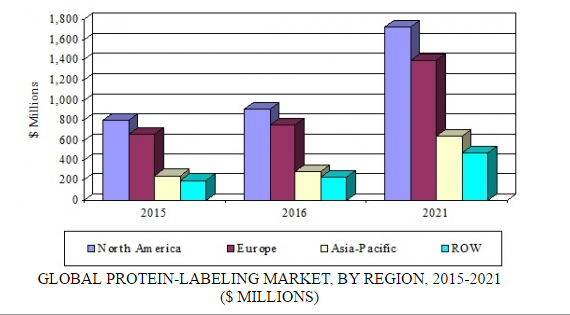 In its recent analysis, BCC Research segmented the global protein-labeling market into regions by North America, Europe, Asia-Pacific, and Rest of the World (ROW). North America held the largest market share in 2015, accounting for $801 million. At a CAGR of 13.5%, it is anticipated that the North American market will exceed $1.7 billion by 2021. The United States leads this market due to surging demand for protein-labeling products, services, and technologies, as well as an increase in investment, funds, and R&D. The lack of skilled professionals and the limited applications of protein-labeling products in life science research are likely to restrain the market during the forecast period. Europe held the second-largest share of the global protein-labeling market in 2015, accounting for $666 million. By 2021, this segment is expected to reach nearly $1.4 billion at a five-year CAGR of 13.0%. France is leading the protein-labeling market in Europe. The growth of this market is supplemented with increasing investment by the European Commission to promote R&D in this sector. The majority of the markets in the Asia-Pacific and ROW regions are untapped. As such, they provide lucrative opportunities for manufacturers of protein-labeling products to expand their businesses. At a five-year CAGR of 17.5%, the Asia-Pacific market is poised to experience the fastest growth during the forecast period. The ROW includes Latin American nations, the Middle East, and Africa. The ROW protein-labeling market is expected to reach $472 million by 2021 at a CAGR of 15.4%. The study by BCC Research examined development and growth of the protein-labeling market. Current technologies, future innovations, significant players, and market forces that are driving interest in clinical, diagnostic, and research applications were assessed in its report, Global Markets for Protein Labeling.